Ammunition is running out. Power is running out. Time is running out... and the Arachnids are coming. You thought you had it easy - a few days shore leave on Tango Urilla, the only colonized world in the Altair system. You were ready to knock back a few beers and enjoy the nightlife. You had been told by the boys in Military Intelligence that the system was devoid of Arachnid activity. Military Intelligence had got it wrong. You have had vacations turn sour before but this time you are fighting for your life. Now locked in battle against a terrible enemy, every shot will count as you desperately avoid the worst the Arachnids can throw at you. Ambush at Altair is an extended series of missions for a squad of Mobile Infantry Troopers. 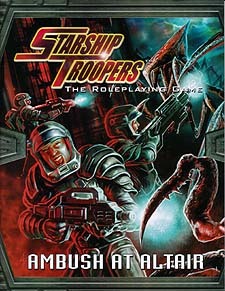 Using the unique scenario format of the Starship Trooper RPG, you can pick up this book and enjoy an evening's game in just a few minutes. For a group of four to six Mobile Infantry Player Characters of 6th to 7th level.